Dalhousie University’s public image could use a facelift. What the university got Wednesday evening was anything but. Jerry Reddick, known as the Dawgfather PhD, posted a series of anti-Semitic tweets Wednesday night in response to the Charlie Hebdo attacks in Paris. The Dawgfather challenged that freedom of speech goes “both ways”. He says his tweets were meant to be satirical, but most found them to be offensive. According to CTV News Atlantic, the Dawgfather says he stands by his tweets. UNews could not reach Reddick for comment on Thursday. Halifax police are investigating after someone complained about the tweets. Reddick told The Chronicle Herald that police ticketed him Wednesday night for breaching the peace after he argued with an officer questioning him about the tweets. Despite this, he told the Herald he has no plans to delete his posts. Shortly after the tweets went viral, some Dalhousie students created a group on Facebook to boycott the Dawgfather’s business. The group, started by second-year psychology student Asrar Haq, was meant to create an open discussion within Dal’s community. Now the group has turned into a 200-person rally to officially boycott the popular hotdog stand at the end of the month. Haq says he’s not trying to put the Dawgfather out of business. He says students have the right to condemn racism and anti-Semitism on campus. And he thinks the best way to disapprove of the Dawgfather’s behaviour is to boycott him. Haq says just because the Dawgfather is well-liked on campus isn’t an excuse for what he said online. He says Dalhousie is an extremely multicultural university, and the Dawgfather should be cognisant of that. A Jewish student at Dal also feels let down, though not necessarily personally targeted. The fourth-year student says he has only ever had positive and engaging encounters with the campus icon. “I’ve always had completely positive interactions with him, and I’ve been (at Dalhousie) for three and a half years,” says the student, who wishes not to be named. Dalhousie students in a fourth-year corporate communications class caught wind of the first batch of tweets late Wednesday afternoon. During a discussion about public relations and the the importance of managing online profiles, particularly on social media, students began sharing the Dawgfather’s tweets with classmates. 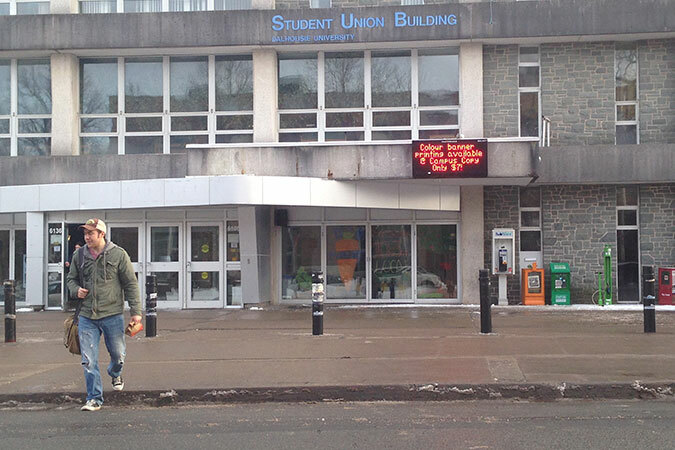 Though a member of the university’s Jewish community, the student says he is more concerned about the Dal community. The Dawgfather is a Dalhousie institution, serving his signature Phat Boy on the Studley Campus since 1996. The tweets in question are disgusting and offensive, and particularly so given that four Jews were murdered in Paris last week simply for being Jews. The overwhelming majority of students are repulsed by these antics, and recognize this as a desperate attempt to gain attention and notoriety. As to issues of legality, that’s entirely a matter for police to determine, and they have our full confidence to do so.